Ming Qian tea refers to tea leaves harvested before the Chinese Qing Ming Festival, which falls around April 5th. Ming Qian tea is regarded as the finest and most prized crop of the year’s production. There is a Chinese saying, "Ming Qian tea, precious as gold." 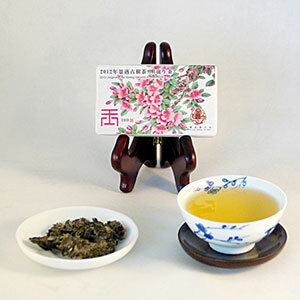 This Jingmai Pu-erh mini-brick is one of our 2012 Ming Qian tea series. This tea is made entirely with leaves from old growth arbor trees from Jingmai. The tea offers clean and balanced rose and honey notes. The flavor is subtle, yet so rich that it coats your mouth cavity and can be savored long after you drink the tea. Like other teas made from old trees, the “Qi” of this tea is felt right away and gives rise to a sense of well-being all over the body. A tea of this quality takes tea appreciation to a different level. Caution: This brick is very tightly compressed to preserve its fragrance. Please use great caution when loosening the leaves from the brick. - Use 5g of tea leaves and brew in a 3-4 oz gaiwan or Yixing teapot. - Use a mixture of chunks of leaves and the small broken leaves to balance the timing of the release of flavors.